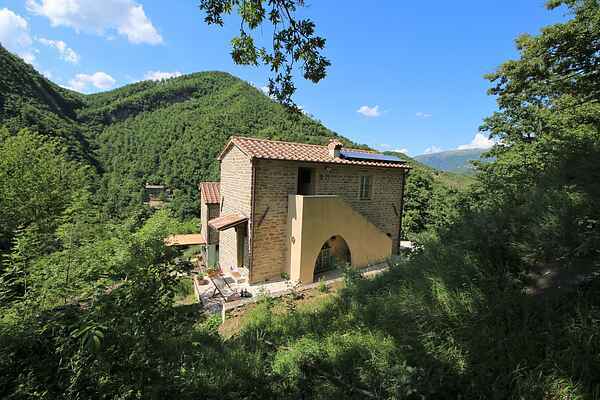 Near Gubbio surrounded by nature is a beautiful country house of stone with a total of 3 apartments. The very hospitable owners live in another country house and there are also three B & B rooms. The two rustic houses are opposite each other on a hill of 500 meters. The décor of all apartments is very tasteful and there are many special details. Each apartment has a private terrace. The owners have created a very cozy atmosphere. The beautiful oval pool is close to the apartment and you have a fantastic view. Here you can really enjoy and relax. There is a large forest near the country house, ideal for walking. The climate is wonderful because of the wonderful fresh air of the Apennines and the breeze of the Adriatic Sea which is 40 minutes away. The overwhelming nature with many colors and fragrances are beautiful in every season. In the neighborhood you can visit different cities and medieval towns. Gubbio, Cagli, Urbino, Città di Castello and Perugia are close to the country house.